I wonder about this blog. Does anyone want to read it? I've always blogged but it was about me and I would send the link to my big island family and my sis in Waipahu...put up pictures...only to find that none of them ever looked at it. Sheesh. But, that was about me, this is about our little girls. Hopefully, this will be a way to keep my family involved with their journey...I'll post pictures, updates on their progress, and most importantly, what to pray for specifically. Today the girls are 1 week old. If they hadn't arrived, I would still be another week away from being 7 months pregnant. My girls are still in the negative. Although we lost Rory, Allie and Casey are still triplets despite only being two. Scott and I think we'll probably fluctuate between the use of the terms "triplets" and "twins" so don't be confused. They're still considered triplets and that is what the hospital refers to them by. So our trips are still in the negative age range. For me, their real age starts on Nov 2 (due date/40 weeks), right now they're still following the growth development for a baby still unborn at 27 weeks. Allison "Astro:" Astro is the oldest and the smallest girl. 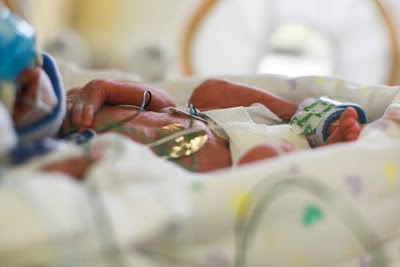 She was born at 1 lb 12 oz, and has lost weight since then...right now she is at about 1 lb 10.45 oz. Astro was the one who sent me to the hospital a week ago when her water broke. She completely ignored all attempts for us to get her just to sit tight, and insisted on arriving. She seemed relieved to get out, she did the best at birth. Maybe the fact that she was on the bottom and was constantly squashed by her two sisters for the last six months. The docs always struggled to get a good view of her during ultrasounds because she was always far low and her sisters sat right on top of her. She's always been the runt, measuring far smaller than her sisters from the very beginning. The specialists were concerned about the size difference appearing so early at 10 weeks gestation, but she kept up...always slightly behind but still chugging along. She wanted out and she seems happiest to be out. 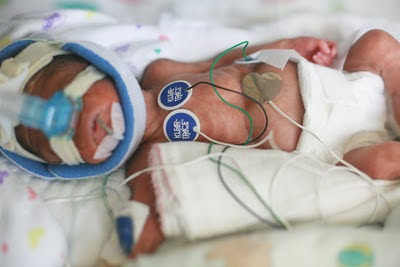 She moved off the breathing tube first and onto Si-PAP. Si-PAP is the scuba gear looking apparatus that engulfs their tiny heads. It's actually used to treat adults with apnea. It just constantly blows air into their nose. Astro is breathing on her own but it's made easier by the pressure blowing of the Si-PAP. Unfortunately, it also squishes her little face so all we get to see is her little squashed up cheeks. 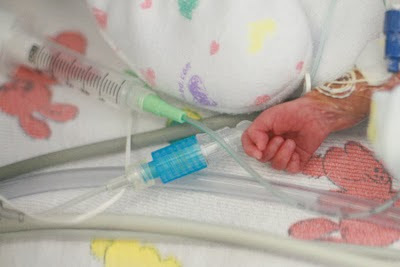 She was only on IV for the first few days (a baby's digestive system wasn't designed to be digesting breastmilk during this phase) but they've slowly introduced breast milk by tube directly into her stomach. There's a lot of risks with digestive problems in preemies. So far, she hasn't displayed any problems and she's taking 2 mL of breastmilk every 3 hrs. She's a little firecracker and I can't believe she already has a personality. On day 2, we heard this muted sound coming from her isolette (enclosed crib) and realized she was crying. Oh, she will voice her displeasure when she's woken up or being moved...or just when she feels like it. So horrible, but it's so reassuring to hear her cry...makes me feel like she's talking to us already. Astro is having some spells of apnea and brady. 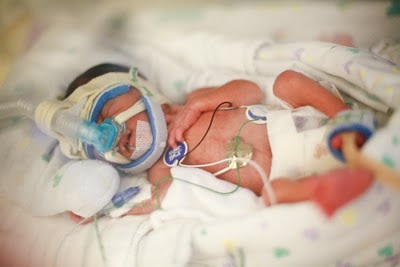 Apnea is when she just forgets to breathe...her brain is having to learn prematurely to control her breathing. Brady spells is when her heartrate drops below 100...normal heartrate at this point is ~150. Sometimes she just needs a little nudge to wake her up and remind her to breathe...it is nervewracking to watch the monitors until her heartrate rises back up. Introducing Astro: (you can see her scuba gear is all ready for diving with Uncle John-John. Casey "Slugger:" Slugger is our fraternal twin. Astro and Rory were identical twins and shared nutrients and oxygen. They were always a concern but Slugger has always been chill. She cruised in her own little space and hung out. She was last to be delivered...and the docs say she probably wasn't real happy to come out. She was a little shocked by birth, she did not respond at first. They had to do chest compressions and give her epinephrine (adrenaline) to get her heart going. Since then, she's just been a little behind her sister, reluctant to move to Si-PAP. She's progressing, just a little behind Astro. She does not have any spells of Apnea or Brady. She was also started on breastmilk feedings but didn't seem to be moving it along. So, they took her off the breastmilk yesterday and she's just on IV. It's not a huge concern but I will breathe so much easier when she displays that she can digest breast milk. She definitely sleeps stretched out...just like her daddy. She prefers legs out straight and arms over her head. I try to get her to curl up because it just looks more comfortable. The nurses say that each girl will open one eye every now and then. But we never see it. They're always sleeping, which is good. We want them to sleep all the time and save up their energy and calories for growth. But I can't wait until they open their eyes...and when they can get off that SiPAP so we can see their little faces. They are precious! Mine were hairy little things too! The losing weight thing is normal, soon you'll have little chunkers! Keep up the great work Keao! 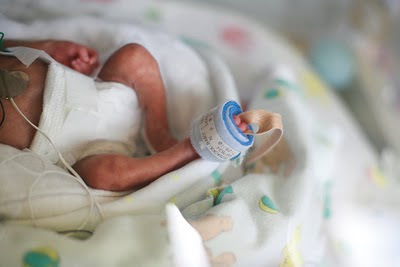 We're all pulling for these little miracles! Keao! They are beautiful!!!!! So precious! Continually praying for them and you guys! That's awesome to hear the progress there making and to hear about there little character quirks and traits! Love you guys! Give the girls a hug from your Pishcura Ohana!